Thanks IanG, that's another vote on the LOUD side. Full Akro , baffles out and I still think it’s quiet on mine? Hi Constant, pleased to hear there's not just me using one of the LOUD cans, though how long I will be able to hear seems to be a matter of debate. The Falco Airbox, Filter and Boot were on the doorstep when I got home today. Yeah the inlets are oval, but the whole thing is a lot less restrictive than the late model RSV one that's on the bike at the moment. I'll fasten it to the RSV airbox and see what sits where. There was an eMail when I got home too, the fork legs were ready. So straight back out again and picked them up. They've had the old, worn, Titanium Nitride coating removed and re-done, new slider bushes, new oil seals and new dust seals. I've just got to put them back together now. Oh, and new Ohlins stickers too, the important bit! The guy did them told me the coating fails partly because the slide bushes wear, resulting in point loading on the coating instead of the load being spread over a larger area. Makes sense, let's see how they do. Fork legs back together, with roughly the right amount of oil in 'em. All the damping adjustments seem to work, and pre-load adjuster moving OK. It's nice to be putting stuff back together for a change, stereo on, an a beer on the go. Hope to have them back in the yokes tomorrow, and maybe a wheel back in too. As I'm sure we all know, photos flatter a bike. Mine's well used, and is very unlikely to ever be what it was when it was new. I want it to look tidy (for it's age!) and to be useable. If I can't rely on it then I've failed. I like the attitude on here, about tweaking, modifying and improving your bikes, and the way everyone shares what they learn. Tip for the lower part of the air boot : if you want a good seal against the frame rails without the ape bodge of a sticky foam ring then cut the ends off the origin later boot and trim the cut ends to fit into the flared ends of the old style unit. It all fits together well and if you fit Edwards tubes as well the airflow is completely isolated from the hot chassis rails. 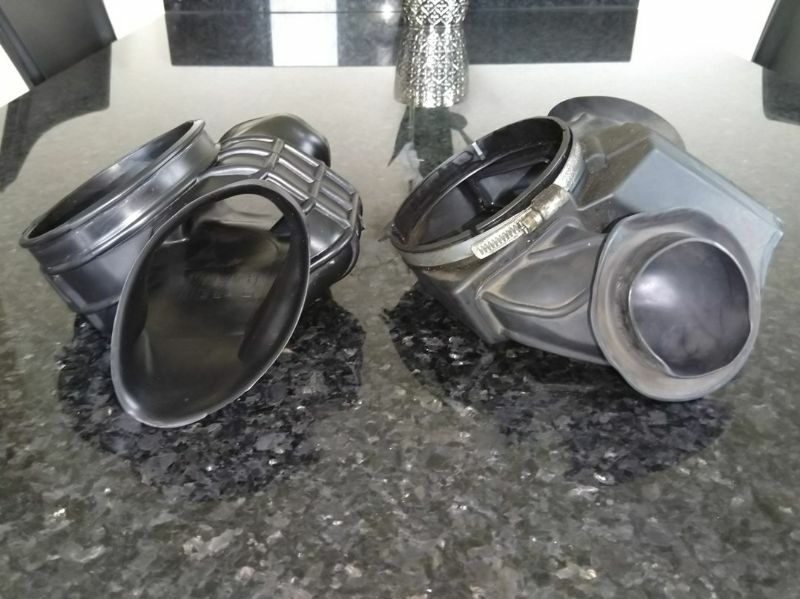 Thanks IanG, that's a good use for the redundant Old Inlet Rubbers and might help make the ovals a little more round. So I'm hoping that parts are going to start getting refitted, every time I've been in the workshop over the last few weeks I seem to have taken yet another bit off the bike. It's pretty sad at the moment. I've spent some of the morning cleaning up the Falco parts to see what's useful. I'm surprised to find the Falco Airbox has a larger volume than the RSV. The top is higher at the front, and the lower has slightly move volume on the right side. I'm even more surprised to find that the Falco Airbox fits under the RSV tank. The Falco item also uses the larger air filter, the same one that was with my Open Airbox Kit. I wasn't happy with the open airbox idea, so I'll fit the Falco airbox. The Falco Boot does have oval holes but they're several times the size of those in the standard RSV Boot I have. These oval holes don't quite line up with the holes in the frame rails, but they're are significantly bigger that the holes in the frame. I had to go to the Post Office this morning, more new bits arriving. 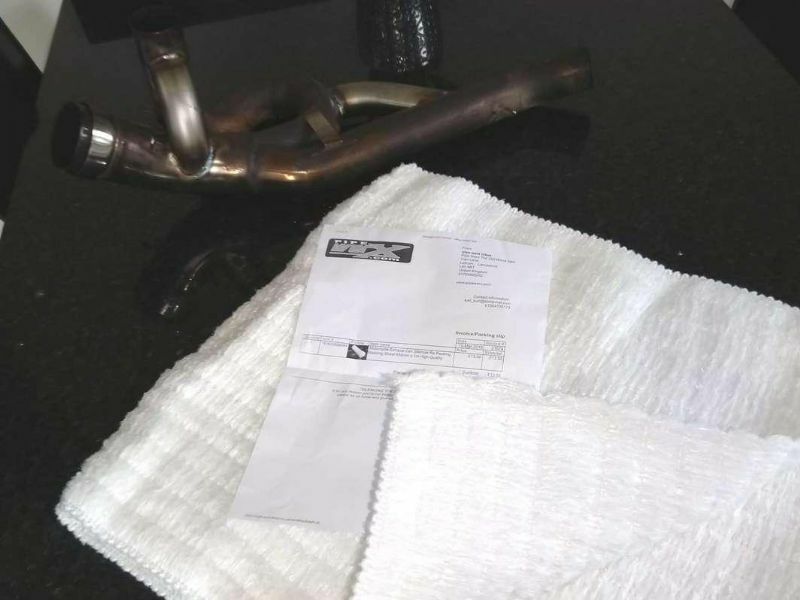 I've got Redratbike's modded collector, and the exhaust re-pack wadding for the Aprilia Racing Ti Can has come. It's getting to the point where I've got to put some bits on the bike as I'm running out of space to stash them. There's still most of the weekend to Go, I'd like to get Johnboy's cables fitted, it seems sensible to do the exhaust before I put the front end back in, and I'd like to get the airbox back on once and for all. Yes those do look bigger than the mille ports, it was a bit of a tight fit what I did but those openings may be too big. Modded collector fitted, New Battery and Starter cables in, and the Ti Exhaust lashed up just see how loud it is before I re-pack it. Wow!! It sounds fantastic, hard to believe it's the same bike with just a few tweaks. The starter spins over loads better, excellent job Johnboy, thanks. It seems to be a pad of steel wool, with a couple of pieces of rockwool insulation amongst it. Nasty. I cleaned up the perforated core tube, and tidied up the stainless steel bands ready to put it back together. Then I've wrapped my new wadding round the perforated tube, an off-cut above and below the tube as a nod towards the pipe being oval, and slid the outer tube over the whole lot. It took all of the wadding, a piece 450x1000mm. 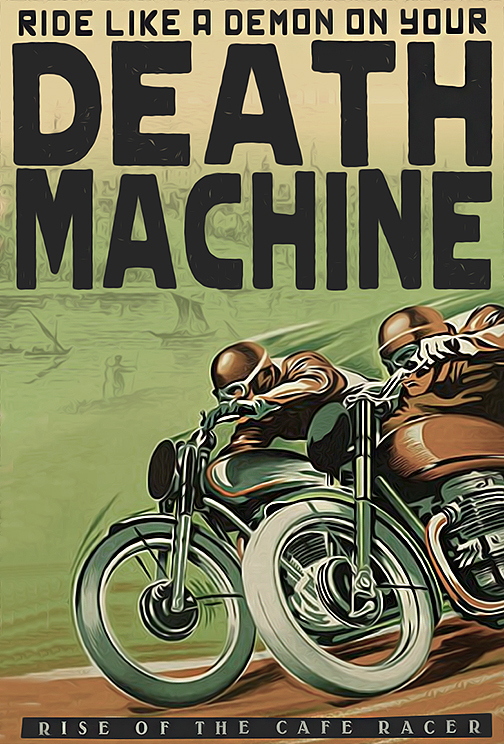 I've run the bike again, and it sounds exactly the same to me. Ah well, it obviously needed doing, can't have it spitting shreds of steel wool out the back, but I did think it would make some difference, to tone if not volume. 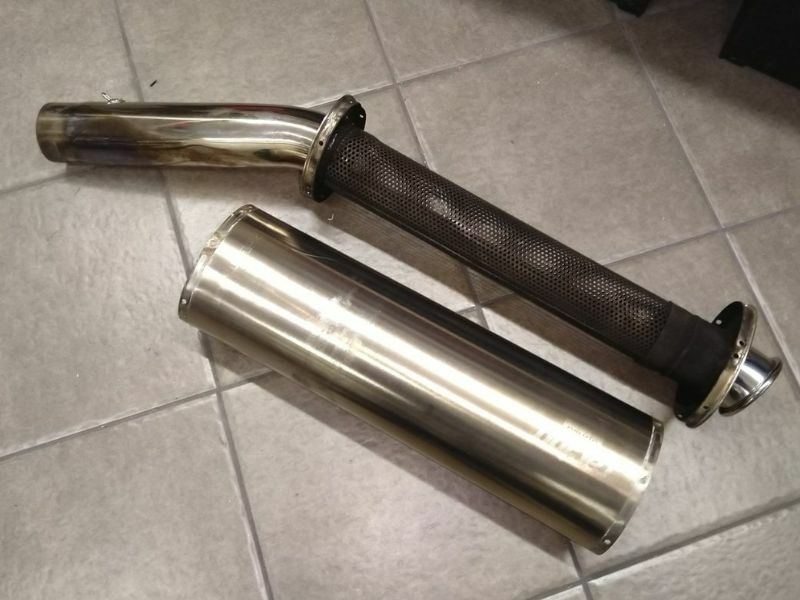 I might have to experiment with a baffle pipe for when I'm just pottering around. Still sounds Fantastic, it might be OK when I get it outside, they always sound much louder if you run them in the garage. Running the new battery and starter cables revealed a couple of things. Firstly, how thin the standard cables are, particularly the Earth connections from Battery to Frame Earth, and Frame Earth to Engine. 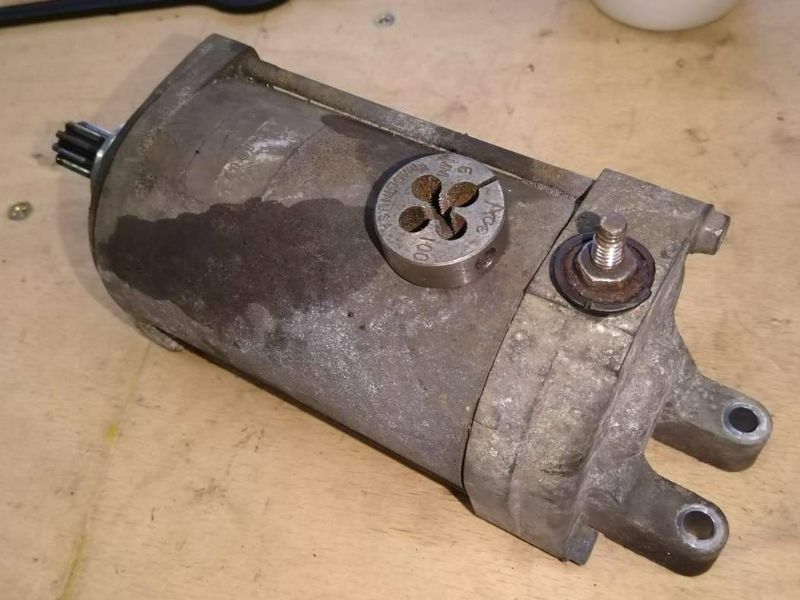 The second thing I found was the awful corroded condition of the Starter Motor connection. The perished rubber boot was in place but I think it was holding water in rather than keeping it out. I had to take the starter off the bike to cut the terminal nut off and clean up the threads. Fortunately it all cleaned up OK, and as I said earlier, works MUCH better. I also cleaned up the surface of the alloy pads that the starter bolts pass through. These need to be clean too as they're the earth connection for the starter. I've applied Johnboy's silicone grease to the connections to try to keep the water out as advised. The Engine Earth bolt was awkward to slacken off, it's not a big socket head bolt, M6, and there isn't straight line access to it from outside the frame rail. I took the coolant bottle off and used an extension with a wobble joint and a hex bit in the end to get to it. I've replaced the socket screw with a normal bolt, easier to get some torque on to it. The Frame Earth, inside the right frame rail, was best accessed with a long extension from the left side of the bike. It was pretty clean so no problems there. The Falco Airbox seems to work OK. 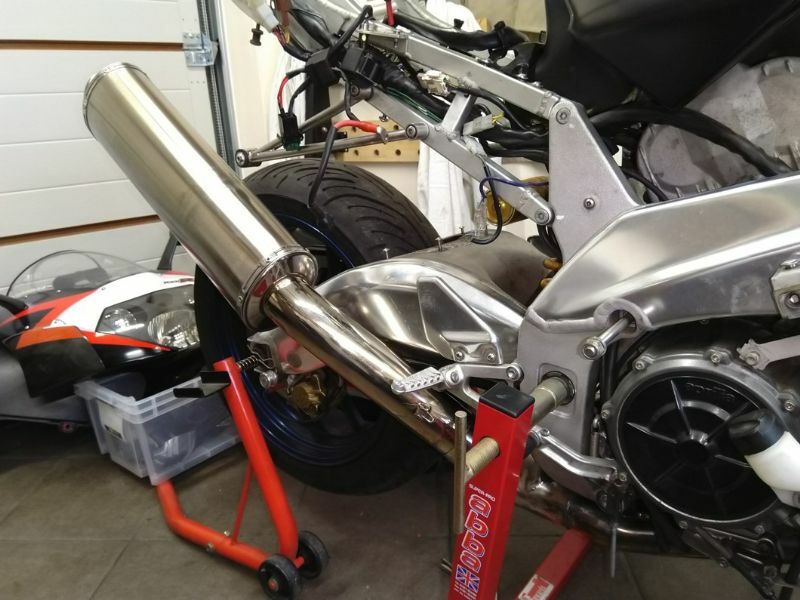 Though it's taller than the RSV unit, with a slightly different shape to the lower section, it fits without modification, and somehow fits under the tank as well. 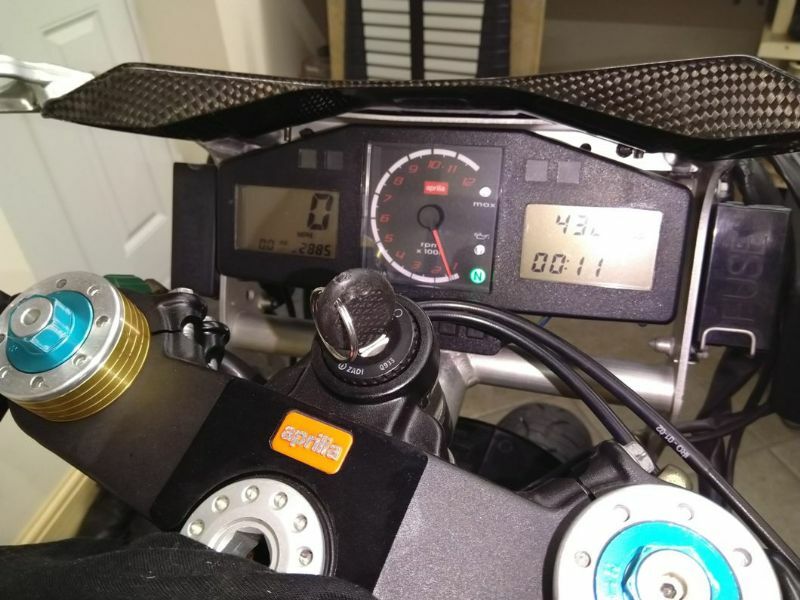 I didn't like the "Open Airbox" idea, this has a bit bigger capacity than the RSV unit, is properly sealed, and takes the taller filter used by the Open Airbox Kit. I thought the stacks might be different for the Falco, but they measure up the same as the RSV items. For the momen t I'm not going to try to seal the Airbox Rubber Boot to the inside of the frame rails, and I won't try to reshape the oval openings to round. 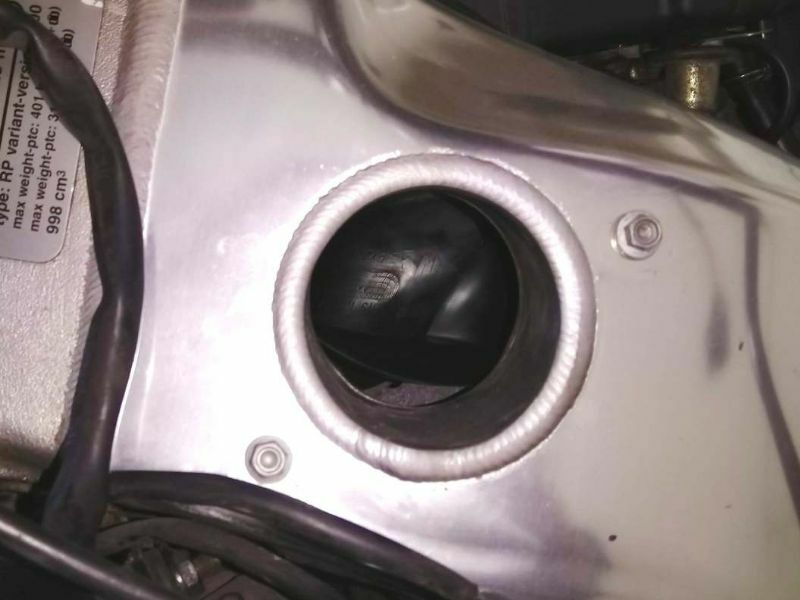 The whole thing is much less restrictive than the old RSV boot, and when the bike's moving there should be enough cold air coming in the ducts to stop the engine drawing hot air from under the tank. Unless you guys know different...? Which reminds me.... The stick-on heat shield on the underside of the petrol tank has fallen off. One of the POs had stich it on with double sided tape that hasn't done well under there. Do I need it? and If I do, has anyone found a good way to stick it on? Quick question who did you send your forks to for the refurb ? Keep up the good work .. look forward to the next episode.. Thanks Mr Miller and Fitz. I'm happy with progress, no disasters so far! Fitz, the forks were done by Gareth at Reactive Suspension between York and Sutton on Forest, he has an Industrial Unit. It's a very professional set up, two Suspension Dynos, Data Logging, and he's developed his own modifications. Seems to do a lot with racers, and runs suspension training courses. I took the stripped fork legs to him, tubes and sliders. While we talked about what was needed he stripped them further to there component parts using special tools in just a few minutes. 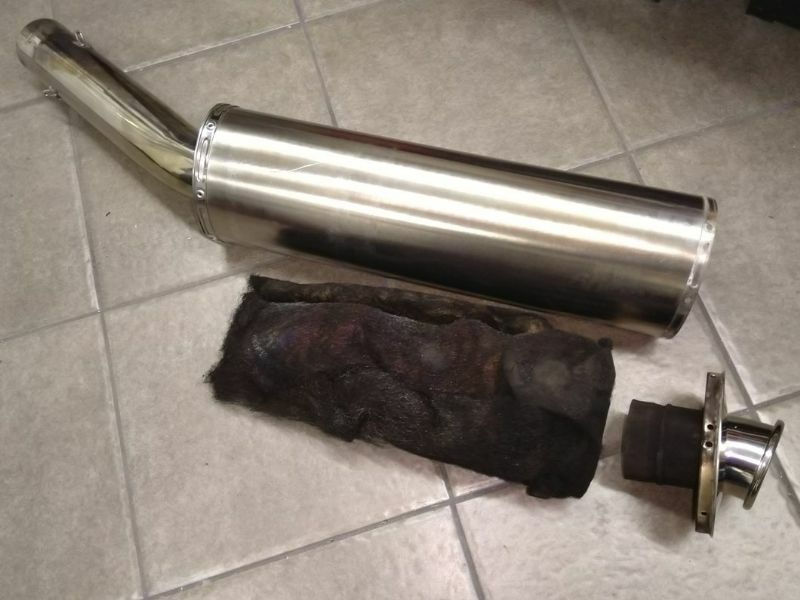 The tubes were sent away to have the old coating stripped and new applied. He's replaced the slider bushes, hydraulic seals and dust seals. More progress this morning. Front end back in, pin-hole-lacquered mudguard on, air ducts on, and lots of head scratching with cable routing. I think I've got the cable routing right, but might have to spend a little time with the Workshop manual to reassure myself. 👍👍 for Gareth at reactive he sorted my setup on the falco when I bought it as it was like riding an ironing board. It doesn't seem fair that the little pieces take as long as the big ones to sort out. I've spent most of the afternoon stripping the slightly dodgy pattern Clutch Lever, clearing all the dead grease, and getting the rust off the seized steel parts. Clutch slave cylinder tomorrow. Progress might be a little slower from now on, my wife has been away with the girls from work for a week in the sun but she's back tonight, and might expect to enjoy my company without having to sit with me and the RSV in the workshop. Fingers crossed she gets bored of my conversation so I have another week or two to finish the RSV! Undertray back in tonight, and more cable routing. It's still very tight from the front of the battery box to the back of the petrol tank, I might have to hack the front out of the battery box to gain 5mm. I ran the bike until the fans kicked in, mainly to check the fans work, and to see that the charging system is doing what it's meant to. It's showing 14.2v on the dash, and though I have seen threads saying not to trust the dash volt meter, it's right where I'd expect it to be. There was some unexpected good news too... Having got the bike running, and set the clocks up properly, it says it's done 28,000 miles, not the 37,000 I thought. Maybe I need to change the subject of this thread to "Not Quite So Old Charger"? Didn't get round to the clutch slave cylinder, but I'm sure it'll still be there when I come back to it. When I set about the second coming of an RSV1000r 2002 which has been sitting still for 10 years in someone’s garden, after around 10 hours labour I popped the new battery on and the bike had done 8400 miles, these bikes are amazing and constantly reward you, I’ve got a few bikes like S1000rr but to be honest, the power and culture these Apes have are perfect for the road, when I purchased the bike, in the dirt and leaves was a set of Renegade race pipes, I couldn’t believe my luck! And a private number plate, I love this bike! I'm certainly pleased with the RSV, but it's the little things that frustrate. Use of cheap fasteners that suffer in the UK climate, made worse by our use of road salt, and worse still by neglect. It wouldn't add much to the cost of a bike to use decent fasteners. And the cheap/nasty Italian electrical connectors are almost as bad as the Jap stuff from the 70s. The crash bungs on the front wheel are already gone. What's the point making the front end out of super-light exotic materials and then nailing a pound of nylon and steel to the front axle!? The slightly high seat, and on my toes issues, are made worse by the fact that I'm a man in his 50s's who likes his food and likes a pint! The back end of the petrol tank isn't very forgiving for those of us with a generous frame. 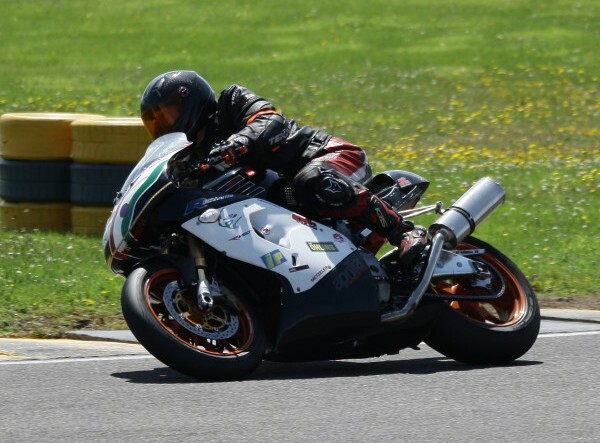 No doubt about it, I need to loose a few pounds to fit the bike better, but I managed OK on the Buell XB12R, and the Brutale isn't exactly a cruiser-style riding position. I haven't ridden the RSV since before New Year, when I popped out for petrol on a dry day. It has/had a worrying low-speed weave at around 40mph. which I hope I've fixed. The (taper) headstock bearings were marked with an uneven wear pattern, and the steering damper rose-joints were rusted and loose. If it still does it when I've finished, then I can try replacing tyres, but I do hope that what I've done has cured it. I'm looking forward to getting the bike back together and useable. The mods described on this forum are exactly the sort of stuff I'm interested in, reliability, better starting, smooth mid-range power delivery, and noise! 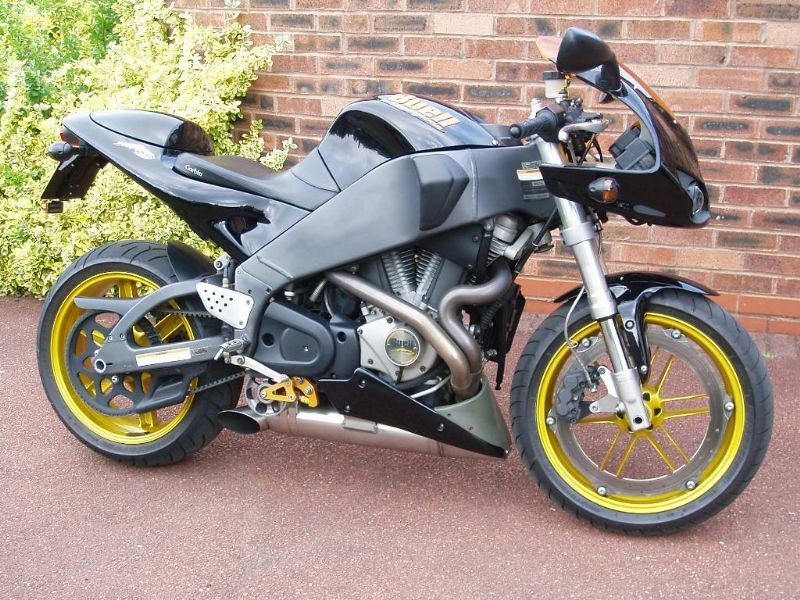 I really liked my Buell, having something different has always appealed, and I liked the big-twin power delivery. For a while I've been trying to set myself up with bikes that are different, and don't cost me money to own while they're just sat in the garage. I've got a 70s Kawasaki and an 80s Yamaha which are holding their value nicely, and the Buell did the same. I traded it in for more than I paid for it, even after several years of happy riding. Having sold it, prices seem to have gone up even more, but I've had one, and enjoyed it. 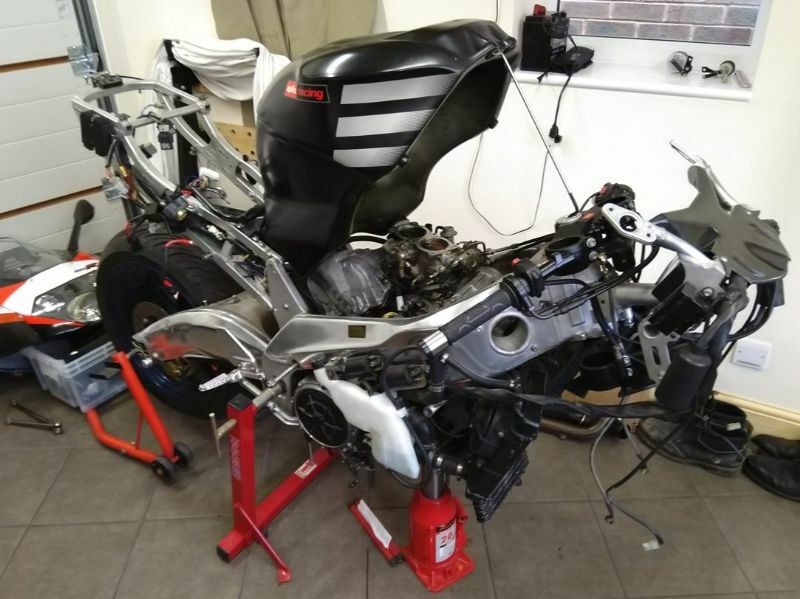 I've missed having a big-twin, I'm not rich (or stylish) enough to be a Ducati man, and hadn't really been looking to buy another bike until a friend at work told me he was thinking of breaking his RSV-R because it was worth more in bits than as a whole. It's like someone coming up to you in the pub, carrying a sack, and telling you he's going to drown these puppies, unless you want them...? So now I'm an RSV owner. I hope I haven't overpaid, particularly as I've spent nearly half as much again repairing and "improving" it. It fits nicely with my other unusual bikes, and will hopefully hold its value and be good to ride. It's not a fixer-upper, I'm going right through it with the intention of it being with me for a while. Until the RSV arrived I didn't have a sports-bike, a bike with a fairing, or a big-twin, and now I have all of these in one. Thanks for the message, for me the RSV is all about the midrange, the ride is tall but once you get used to using the grunt in the midrange you’ll be smiling all the time your riding, I agree with the cheap fixings, but that’s Italians for you, they intend to bolt on instead of manufacturing there own components, or investing in better quality, but, what you do get is great handling and stand out stand alone soul of a bike, for me these bikes are great value, I’ve had everything from Ducati’s to Gixers, ZX10r, S1000rr, R1, KTM’s, they all have power and in some cases amazing quality, but I still think the RSV1000r has something a little different, takes me back to when 1000cc bikes felt big and a handful. Now that I've had a look in the Workshop Manual I know the lower clutch slave fastener is cunningly hidden behind the rubber doorstop on the end of the fairing support post. Ah, those cunning Italians. There seems to be something missing from the top of the clutch cylinder spacer, there a shiny threaded hole where it looks like a PO has removed something. Anyone know what's missing, or have a photo of the upper side of your clutch slave cylinder? Low speed tram lining...had it with my Tuono and tracked it down to the Ohlins steering damper, one of which I guess you have fitted. 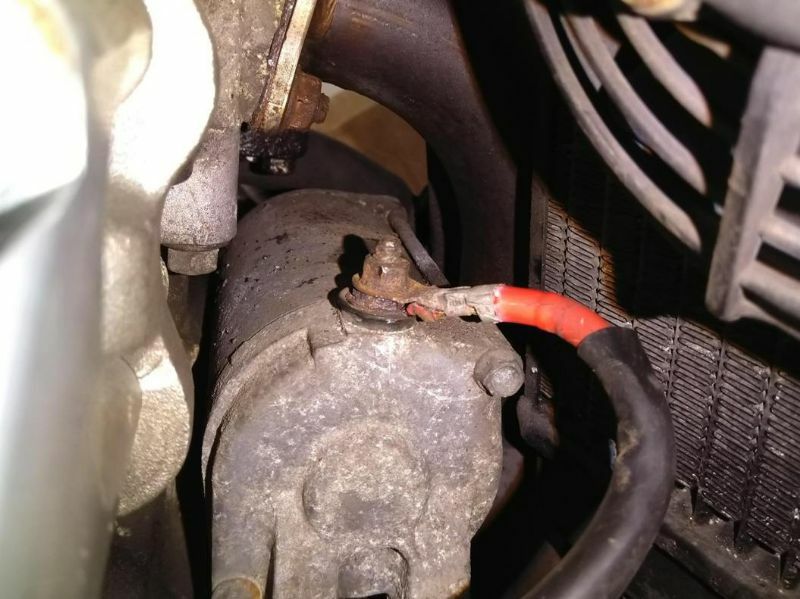 Pull the piston in and out; if it's really hard to get moving then gets easier once it is moving, the bushes have dried out. The cure is a service, which isn't cheap. I decided not to invest £100+ on the service and re fitted the OEM damper, problem solved. Those are exactly the symptoms, and I have noticed that the steering damper is difficult to get moving when it's been sat for a while. It's been on the bench a little while, you pick it up, and it won't move until you really lean on it! Thanks. The shiny tapped hole behind the clutch slave cylinder was an M6 nut lost by a previous owner that's found its way in to the notch at the back of the clutch slave cylinder. More good news, nothing missing. Do I need to brace myself for a failure? Will I get any warning...? Oh.and another thing... This was lodged on top of the engine cases, obviously a drain pipe from somewhere, rotted off whatever alloy part it was fastened to. The part in the picture I'm sure is from the bottom of the fuel tank where the water drains connect. The aluminium part is actually part of the tank. 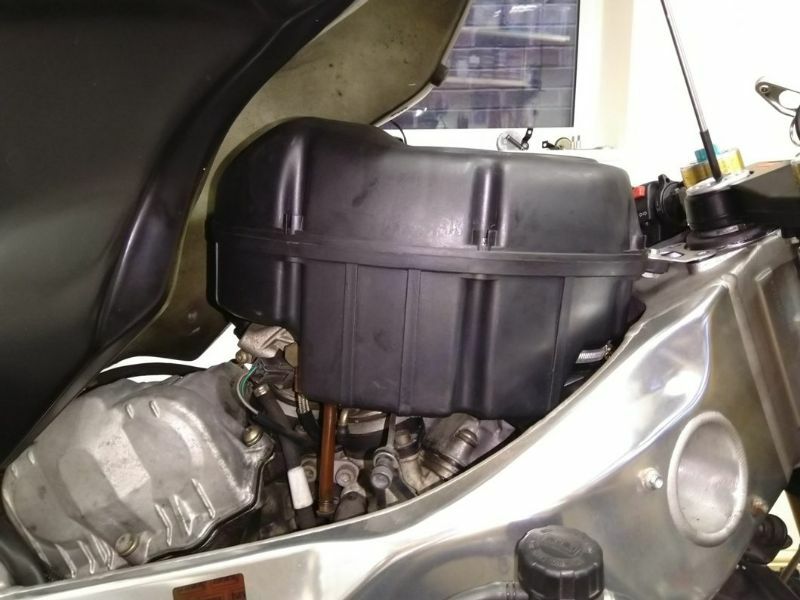 Look at the bottom rear area of your tank, there are 2 drain pipes...that's one of them. They do block up, so I'm guessing yours did and the water caused the corrosion. I've got an Oberon clutch slave fitted; you can also get MPL ones. 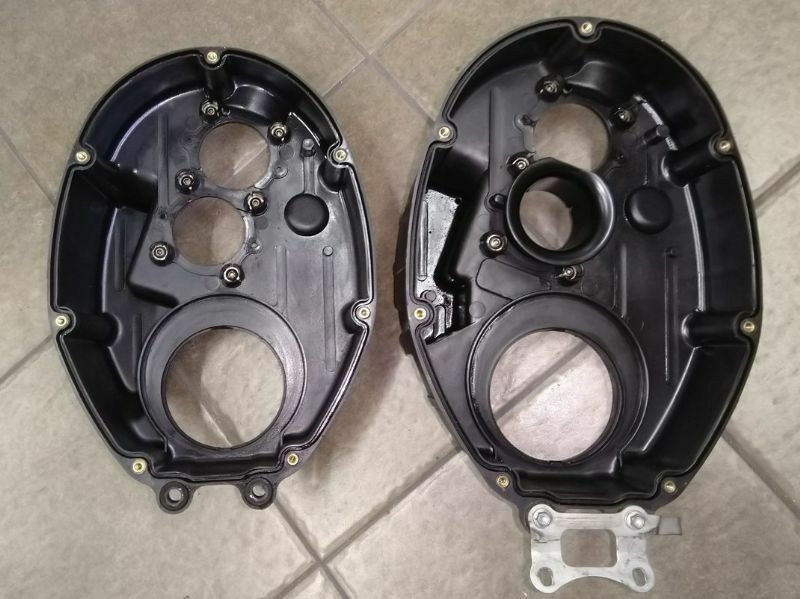 They both have different sized pistons fitted than standard and so make the force required to pull the clutch lever in, less. 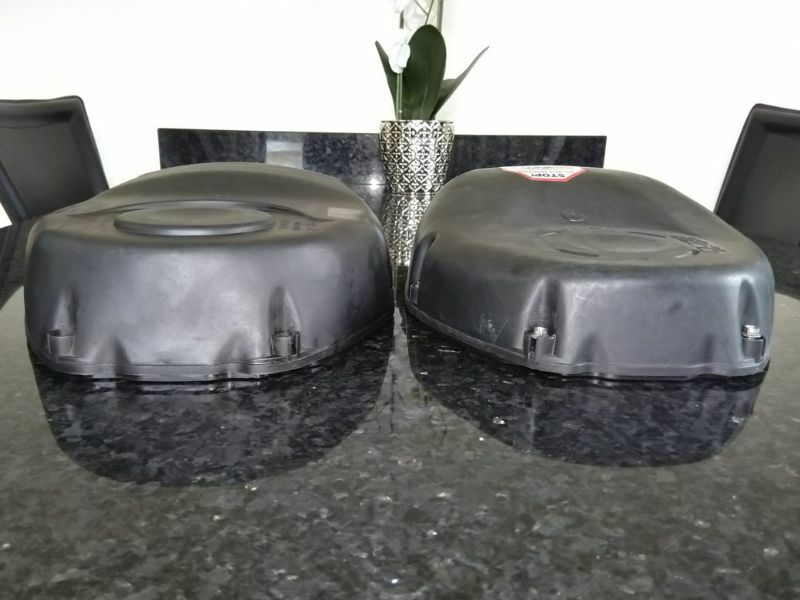 OEM slaves are known to leak, but can be re sealed., so can the after market ones. It's the reduced lever pull required that is why most people change them.